Ferns are a class of plants that include about 12,000 species in 150 different families. In their native habitats, most types of ferns grow on the moist, nutrient-rich forest floor where they receive little light. Some are epiphytes, nestled on the branches of tall trees. Just a dozen or so make their way into our homes. Their diverse forms offer plenty of variety to choose from, and make them fascinating to grow indoors in hanging baskets or perched on pedestals. In Victorian times, Boston fern could be found in many parlors and porches. Today, it's still a hands-down favorite in the home. Caring for Boston ferns is easy. 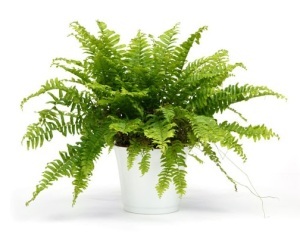 Just place your fern where it'll get indirect light (some direct morning sun is fine) and keep it moist. No pampering is required. Despite their tropical beginnings, most types of ferns grow best in average or slightly cooler room temperatures (70°F/21°C during the day and 60°F/16°C at night). Ferns don't like drafts, especially dry heat from heat vents, which can cause brown leaf tips and leaf loss. 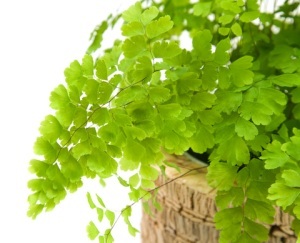 Intricately patterned leaflets make maidenhair fern (Adiantum raddianum) one of the most stunning ferns anywhere. It's also one of the fussiest, preferring high humidity that's difficult to maintain in most homes. However, those dainty leaflets will thrive in a terrarium, surrounded in moist air. Trailing fronds densely covered with leathery, button-shaped leaflets make button fern a spectacular accent among other tropical plants. Put one on a multi-level plant stand with flowering plants -- or other ferns. Its care is easy -- just put this New Zealand native in a bright location and water regularly. It's adaptable to average home conditions. Forty percent humidity is considered "average" in most homes. Fortunately, that's a comfortable level for people and most plants. However, many types of ferns grow best with 60-70% relative humidity. Short of turning a room into a misty rainforest, there are a few things you can do to keep ferns happy. Check out these easy ways to raise the humidity for indoor ferns. 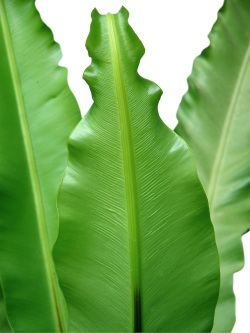 Fronds that unfurl from the center of the plant give birds nest fern its common name. Lush and bold, the deeply veined fronds are spectacular, reaching 2 ft (60 cm) long. Less finicky about humidity and light, this is one of the easier-to-please indoor ferns.